Lightweight metals are forecast to enter a growth phase as both material maturity and market drivers become aligned. 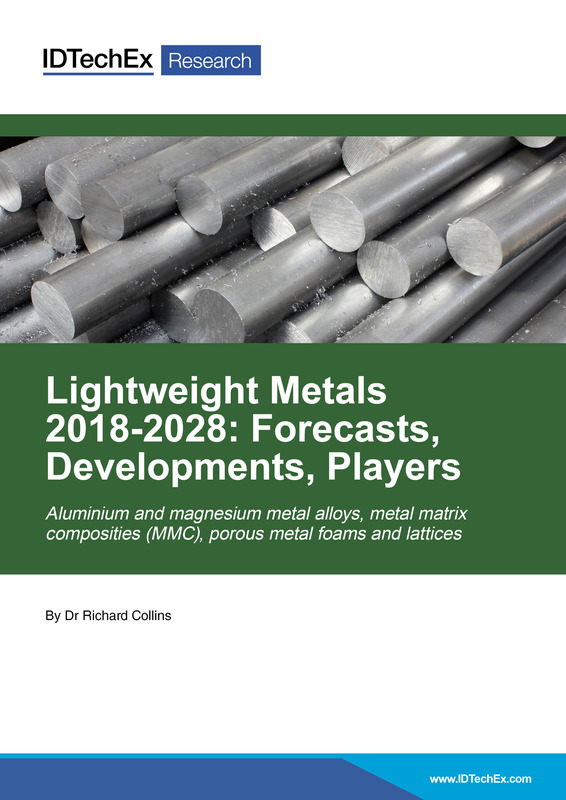 IDTechEx has released a new technical report on this topic, Lightweight Metals 2018-2028: Forecasts, Developments, Players, which provides extensive coverage of this field based on analyst-led primary research. There is no material more central to this topic than aluminium. As extruded, rolled, or cast parts aluminium is penetrating all sectors, but if anyone assumes that the technological advancements have plateaued, then they could be about to miss some of the largest changes the industry has seen in recent years. One of the keys to these advancements involve the uptake of alternative alloying metals: lithium, scandium, and beryllium. The world of aluminium alloys is not a closed book. There are minor advancements being made with minimal sub-percentile composition alterations, age hardening, and melt conditioning processes, but the largest change is set to come from looking to alternate alloying metals. Those of note include lithium, scandium, and beryllium with each one being discussed below. The new report from IDTechEx has a specific focus on aluminium and magnesium alloys, metal matrix composites and metal foams. To see the latest in this research, including market forecasts, company profiles, technological advancements, and supply chain analysis, see the new report Lightweight Metals 2018-2028: Forecasts, Developments, Players. Lithium is used in small percentages with aluminium to great effect. Improvements of fatigue crack and corrosion resistance as well as enhanced specific strength and stiffness are observed, and the market is just at the start of a significant growth period. This forecast growth has been bought upon by some significant investments and from the announcements from the aerospace sector. Alcoa (now operating as a separated fraction called Arconic) invested in a new plant in Indiana, USA, that was claimed to be able to produce 20,000 tonnes of Al-Li alloy annually and Constellium have also increased their capacity with a facility in Issoire, France, with a reported capacity of 14,000 tonnes. These not insignificant investments have been with a view to the upcoming industry demand. Already small amounts of Al-Li alloy is used in the A380, A350, 787 and G650, but this percentage will increase dramatically for the next-generation aircraft, the main headline is that this material is set to be used as the fuselage for the Boeing 777X series. Despite this uptake, this alloy is not without a looming problem. Due to the large demand for lithium-ion batteries the cost for lithium metal is escalating. This price increase puts more pressure on the industries to improve the buy-to-fly ratios and increase the amount recycled. It will certainly hinder the rate that this advanced material enters industries without the same deep pockets. The significance this metal could have on a multitude of industries is not spoken about enough. The fantastic properties are extensive, but relevant to this article and report is the role it plays in alloying with aluminium through the beneficial formation of cuboid microstructures (see image). Scandium provides an improved tensile strength and crucially a reduction in crack formation and improved strength of welds. It has been said that if you could choose one metal to alloy with aluminium it would be scandium. The problem has always been the very price-tag, scandium is not directly mined and is rather a by-product of other mined material. This is about to change, there are lots of proposed mining projects current seeking permission, raising funds, and completing feasibility studies. If they were all to become operational the annual output of scandium oxide (the precursor) would increase more than 20-fold and the price could drop from $2,500/kg to $1,500/kg. These mining projects are indicated in the chart below, the current annual amount indicated by the purple strip at the bottom and the proposed projects with expected start dates and annual average capacity in the other colours. Although the overall amount is relatively small to other mined metals, when it is considered that 1% or less is required to have an impact it is easy to see how significant this metal can become. Proposed scandium oxide production with each project in a different colour. The timeline and average production values are from announcements or estimates. Source: IDTechEx Research (Lightweight Metals 2018-2028: Forecasts, Developments, Players). Al-Sc alloys also have a large amount of potential for the 3D printing of metals, Airbus Group Innovation have developed and patented an aluminium-magnesium-scandium alloy called Scalmalloy. This has already been used to make innovative brackets, motorbikes, and a bionic partition. For more information on 3D Printing Metals, see the syndicated report from IDTechEx. From left to right: An SEM micrograph from AMG Aluminium displaying the cuboid microstructure, a bike and parition both made of Scalmalloy by by APWorks (a 100% subsidiary of Airbus). Source: AMG Aluminium and APWorks. Beryllium has strength and stiffness-to-weight properties above all other lightweight metals but will not have the same impact as the other alloying metals. When used in a high percentage (ca. 60+ vol%) the effects on temperature stability and coefficient of thermal expansion of aluminium, coupled with the lightweight advantages, gives it some market opportunity. The main applications are in precision avionic electronics and communication devices. IBC Advanced Alloys and Materion are leading this sector and have both developed castable solutions to make lower cost near-net shape and reduce the wastage, even at the expense of some of the specific stiffness. A powder metallurgy process is currently the most used for this material. Challenges that will not desist are the health & safety implications and the raw material scarcity that causes an intimidating price-tag when used in these high-volume percentages and makes the material unattainable to most markets. There are also opportunities for emerging metal matrix composites (MMCs) that possess a similar blend of properties at a lower price point to take away some of this market from beryllium. These are investigated in detail within the new report. For more information on these alloys and more see the IDTechEx report Lightweight Metals 2018-2028: Forecasts, Developments, Players. All report purchases include up to 30 minutes telephone time with an expert analyst who will help you link key findings in the report to the business issues you’re addressing. This needs to be used within three months of purchasing the report.